The story of biology begins in chemistry. We must have a basic understanding of chemistry to understand biology. This is because, everything that is made up of matter (from rocks to human beings) is made up of atoms. The story of YOU is more beautiful and complex than you can ever image! Many scientists believe that our universe started with a "BIG BANG" or a "BIG BANG-LIKE" event. The universe we live in was created by some type of BANG that contained all of the subatomic particles needed to make matter. In the beginning, the early universe was too hot for atoms to form, but as the universe cooled the simplest atoms were able to form. The first atoms to form were hydrogen and helium. Hydrogen is made up of only 1 electron and 1 proton. Helium is made up of 2 electrons and 2 protons. Stars are made up almost entirely of hydrogen and helium. All of the heavier elements are made when a star dies and explodes as a super nova. The matter that you are made of has been around since the beginning of the universe 13 billion years ago. All of the heavier elements required for life like you and I to exist, were form in the cauldron of an exploding star. We are all made of stars! Atoms are the fundamental unit of matter. That means that all matter is composed entirely of atoms. Atoms are made up of a combination of subatomic particles, which are protons, electrons and neutrons. 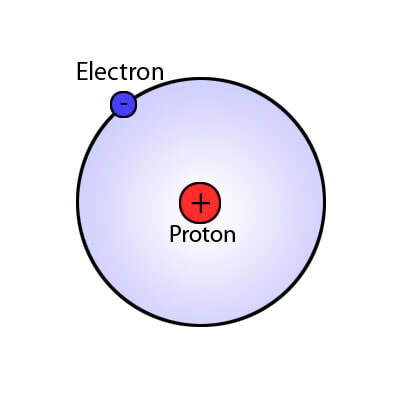 PROTONS are positively charged and are found at the nucleus (center) of the atom. ELECTRONS are negatively charged and are found on the outer portions of the atom. NEUTRONS have no charge and are found in the nucleus of the atom. The simplest and most abundant atom in the universe is the hydrogen atom. 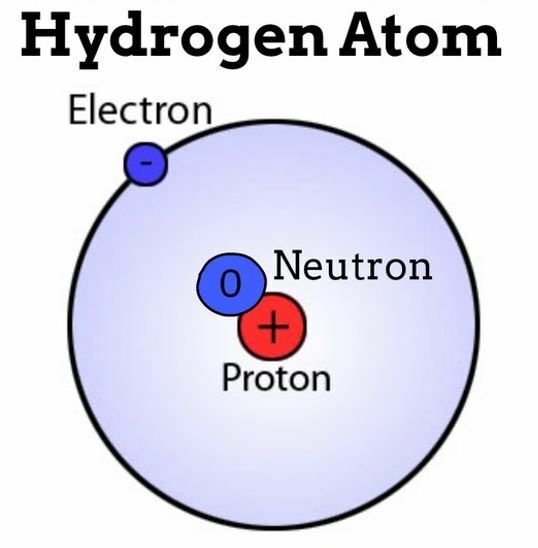 The hydrogen atom contains only one electron and one proton. It is the first element on the Periodic Table of Elements and is abbreviated as H.
Electrons contain far less mass than protons and neutrons. Therefore, essentially all of the mass of an atom is in its nucleus. For this reason, the "mass number" of an element is equal to the average mass in one gram of those atoms. Sometimes this number is rounded so that it is equal to the number of protons AND the number of neutrons in the nucleus of the atom. The number of neutrons can fluctuate in atom, turning that atom into an ISOTOPE. However, the number of protons in the nucleus cannot change, without changing the identity of the atom itself. For this reason, we also have a value called the "atomic mass number" which is the number of protons in the nucleus ONLY. Atoms are neutral and have equal numbers of protons and electrons. The number of protons defines the identity of the atom. An isotope is an atom that has a different number of neutrons. When we look at carbon on the periodic table, we see that carbon has 6 protons, because it has a mass number of 6. Wee also see that it has 6 neutrons, because the atomic mass number is 12 which is the total number of protons and neutrons. 12 = 6 protons + X neutrons --> 6 neutrons. So if I told you I have a carbon atom that has 14 neutrons, you should be able to recognize that as a carbon isotope. Isotopes, especially carbon-14 isotopes are very important to biology. Isotopes decay at a steady rate. Because all lifeforms as we know it are "carbon-based" we can look at the rate of decay of the carbon isotopes in decaying organic matter, and get an estimate of when the organism died. 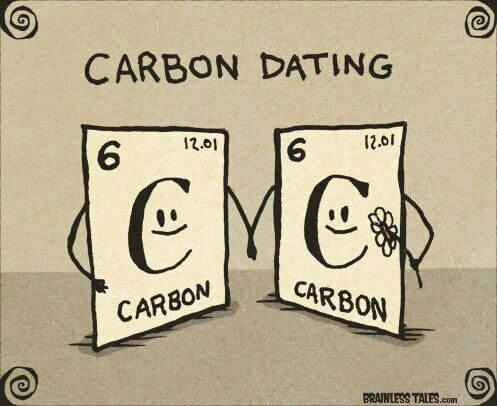 This is the basic premise behind carbon dating! An atom, by definition, is neutral (uncharged). That means in an atom, the number of protons will equal the number of electrons. The structure of the atom will dictate its properties. Atoms can create bonds using their outermost electrons. Atoms are uncharged when they contain equal numbers of electrons and protons. Should an atom acquire an electrostatic charge, it is called an ion ( FIGURE 2.3 ). The addition of one or more elec-trons to an atom means there is/are more nega-tively charged electrons than positively charged protons. Such a negatively charged ion is called an anion. By contrast, the loss of one or more electrons leaves the atom with extra protons and yields a positively charged ion, called a cation. As we will see, ion formation is important to some forms of chemical bonding. The negatively charged electron(s) will orbit the positively charged nucleus of the atom in an electron shell or energy level. Atoms can either gain or lose electrons from their outermost shell and become charged. A charged atom is called an ION. An atom that gains 1 electron will become an ion with a -1 charge. An atom that gains 2 electrons will will become an ion having a charge of -2. An atom that gains 3 electrons will become an ion with a -3 charge... and so on. This works the other way too. When an atom loses 1 electron, it will become an ion with +1 charge. When an atom loses 2 electrons, it will become an ion with +2 charge. When an atom loses 3 electrons, it will become an ion with +3 charge... and so on. Remember that electrons are negatively charged, so loosing an electron, means gaining positive charge. An ion that is positively charged, is called a CATION. Conversely, gaining an electron means gaining a negative charge. An ion that is negatively charged, is called an ANION. I like to think of the charge resulting from the gain or loss of electrons like a nasty pimple. Pimples are negative. We usually don't really want them around and we probably want to get rid of them right away. Since pimples are seen as something negative (like the charge on an electron), when this diva LOOSES her pimple it is a positive thing! If she has 2 pimples and looses them it is 2 times as positive and loosing just one, and so on. When you loose something negative it is a positive thing. This works in reverse too. 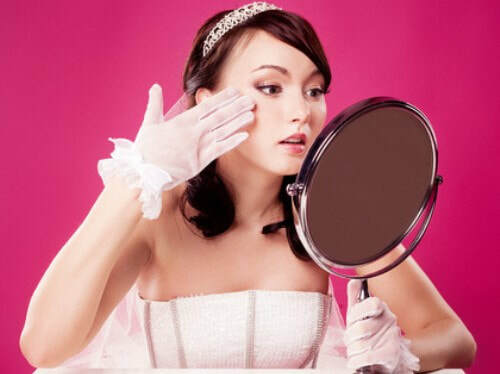 If this diva is getting ready to go out and she GAINS a pimple (something that is negative) that is a negative thing. If gains 4 pimples, then WOW, that's quadruple the negativity! The electron in the outermost shell determines an atom’s ability to create bonds with other atoms. 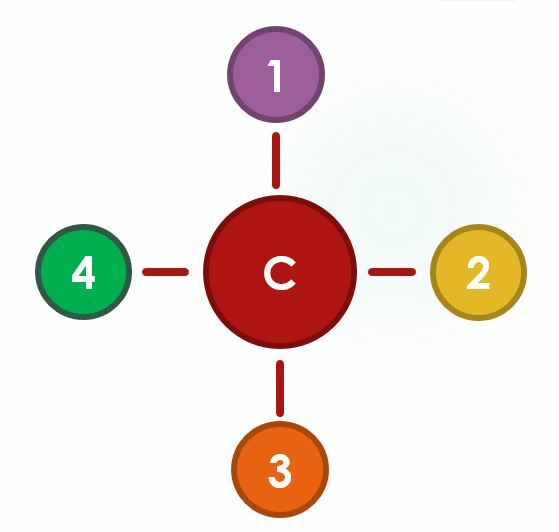 A carbon atom has 4 electrons in a valence shell that holds 8. Carbon is able to completes its outer shell by sharing electrons with other atoms in four covalent bonds. All life as we know it is carbon-based. ​The reason for this is that carbon is the most versatile element, since it is able to form 4 strong bonds. This allows for a vast array of carbon-based molecules (called organic molecules) to form. Carbon is able to form large complex molecules. 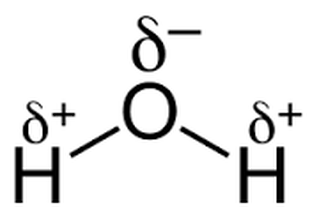 Organic molecules tend to carry a number of hydrogen atoms as well. The most important elements for life are carbon, oxygen, hydrogen and nitrogen. 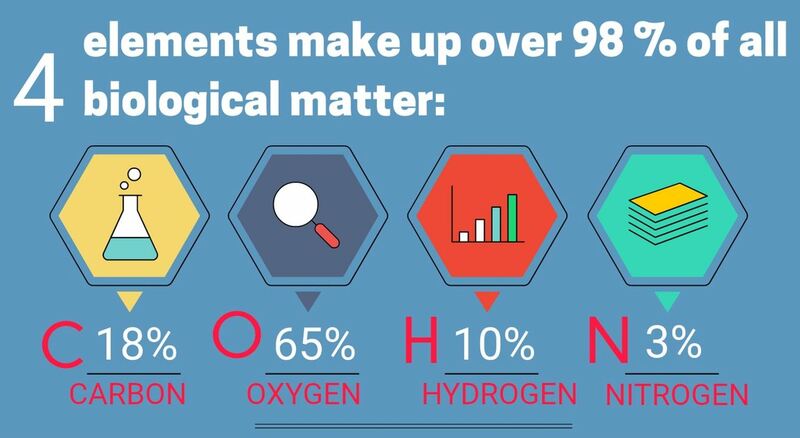 Surprisingly, our bodies (as well as all biological entities) is more that 98% carbon, oxygen, hydrogen and nitrogen. E​ach shell has space for only a limited number of electrons. The shell that is closest to the nucleus is considered the shell at the lowest energy level. This shell can hold as many as 2 electrons, and no more. The second shell is further away from the nucleus and is at a higher energy level than the 1st shell. It has a larger volume and can hold a total of 8 electrons. The third shell is even further away from the nucleus and has an even larger volume that can hold up to 18 electrons. Life and its chemistry are tied to water. Life began in water and evolved there for 3 billion years before spreading onto land. And all life, even land-dwelling life, is still dependent on water. Your cells are 75% water. The composition of the water surrounding the cells (extracellular fluid) is similar to sea water. When life evolved to move out of the ocean, we had to take the ocean with us! Water is the most abundant compound on the surface of Earth. the positively charged atom in this type of attraction is always a hydrogen atom. each hydrogen atom of a water molecule can form a hydrogen bond with a nearby partially negative oxygen atom of another water molecule. And the negative (oxygen) pole of a water molecule can form hydrogen bonds to two hydrogen atoms. Hydrogen bonds between molecules of liquid water last for only a few trillionths of a second, yet at any instant, many molecules are hydrogen-bonded to others. 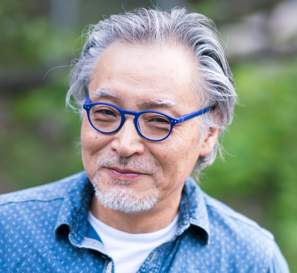 This tendency of molecules of the same kind to stick together, called cohesion, is much stronger for water than for most other liquids.The cohesion of water is important in the living world. Water is considered a POLAR molecule Since it is slightly negative on one end, and slightly positive on the other end! 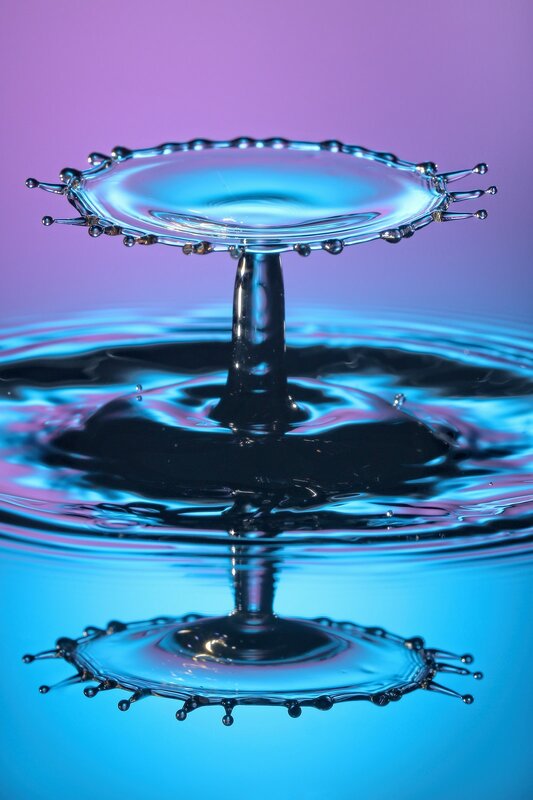 The Polarity of water allows it to have the ability to dissolving a variety of different substances! This is why water is called the UNIVERSAL SOLVENT. 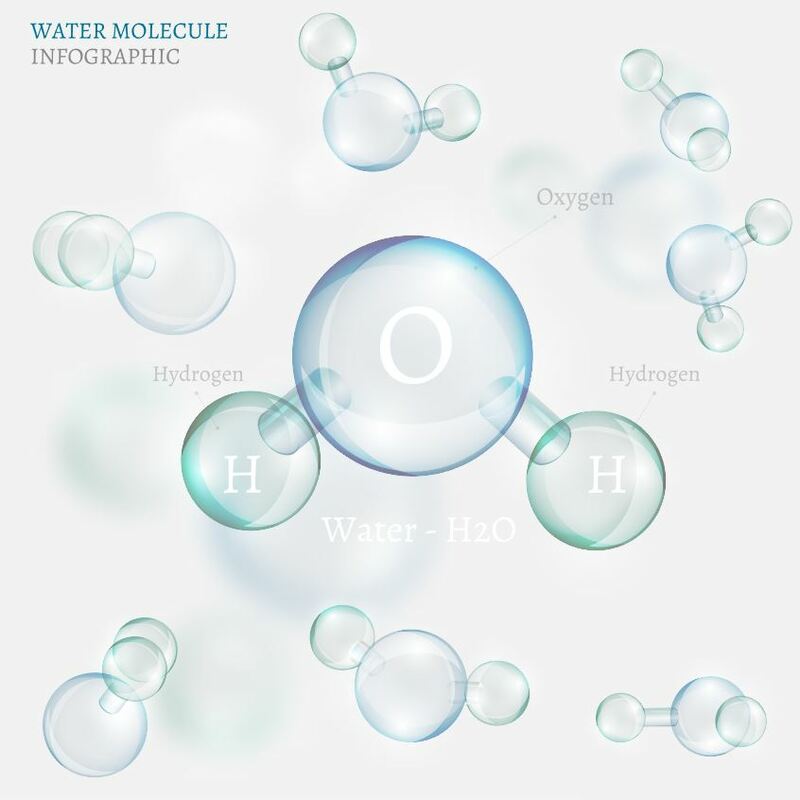 Water can dissolve more substances than any other molecule! Also, atoms have to get close enough to react in order to form molecules.... And, since ATOMS DON'T have legs... The atoms are able to find each other as they float around in water. In water, atoms can easily travel and react! Water is resistant to temperature change. Thermal energy is the energy associated with the random movement of atoms and molecules. Thermal energy in transfer from a warmer to a cooler body of matter is defined as heat. Temperature measures the intensity of heat—that is, the average speed of molecules in a body of matter. If you have ever burned your finger on a metal pot while waiting for the water in it to boil, you know that water heats up much more slowly than metal. In fact, because of hydrogen bonding, water has a stronger resistance to temperature change than most other substances. Trace amounts of other elements may also be needed depending on the organism. These usually include sodium (Na), calcium (Ca), manganese (Mn), iron (Fe), copper (Cu), and zinc (Zn).